The format for Lou Prato’s fifth and latest book was something of a happy accident. 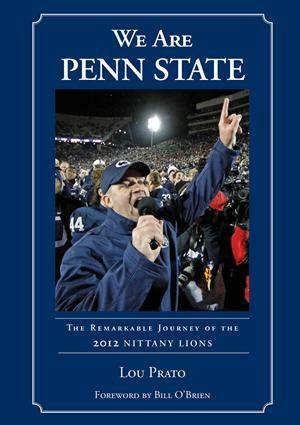 It was his publisher, Prato says, who suggested the idea for a diary of the Nittany Lions’ 2012 season. The catch was that the season was already over. Prato ’59 tackled the challenge anyway. In the space of about four months, Prato turned his encyclopedic knowledge of Nittany Lion football—he did write the Penn State Football Encyclopedia, after all—and countless hours of intensive research into a book that does justice to the unforgettable events of last season. The result is We Are Penn State: The Remarkable Journey of the 2012 Nittany Lions, with a forward by Bill O’Brien. It’s on sale now in hardcover and as an eBook. This entry was posted in Uncategorized and tagged 2012, Bill O'Brien, Lou Prato, Penn State Football Encyclopedia, We Are Penn State. Bookmark the permalink.